Its November. For those of us crafty folks, its also known as the time to get busy! By my calendar, there are currently 51 days left until Christmas. Luckily, I have gone into this winter gift-giving season with a bit of a plan. Its possible that I may make some other items for my family here in town, but I have no idea at the moment. I’m happy to report that I’m making progress on two of the four projects listed above – the cowl (because I have to mail it) and the woven scarf (because its lace weight and painstaking to make = time consuming). Here’s a picture to whet your appetite. I’m really digging the gradient in the weft. Will post full project notes, including yarn content (note: all stash yarn!) 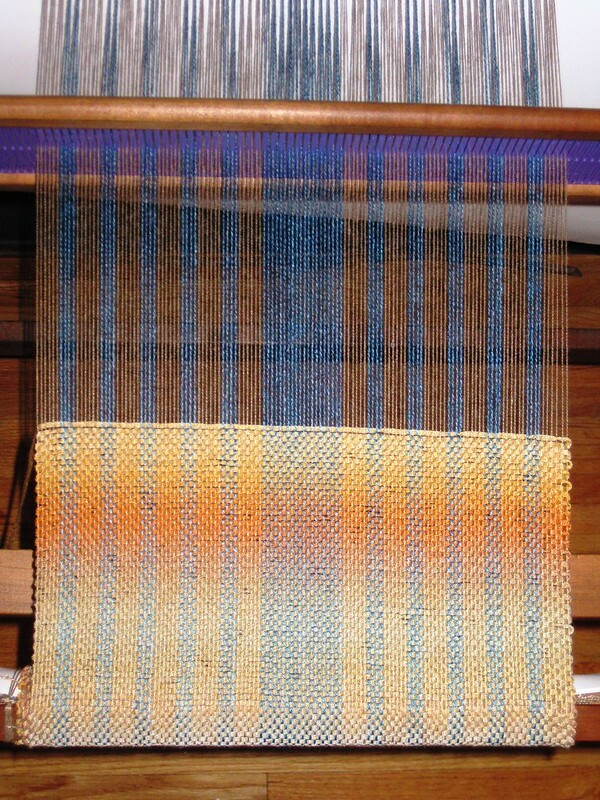 once its completed and off the loom. No, I haven’t forgotten to update y’all with info and pictures from my cardigan project. Rest assured, it now has a sleeve and part of the second sleeve. Its going to be a bit of a back-burner project (yet again) due to all the gift-making projects on the go, but I am determined to finish it sooner rather than later. § One Response to Time to get busy! You are currently reading Time to get busy! at When Gaia Smiles.